Instead of design, Roman and Williams strove for simplicity and transparency. For example, they preferred to use an exposed screw rather than a glistening glass wall, and worked to get to the essential needs of a great place to eat. 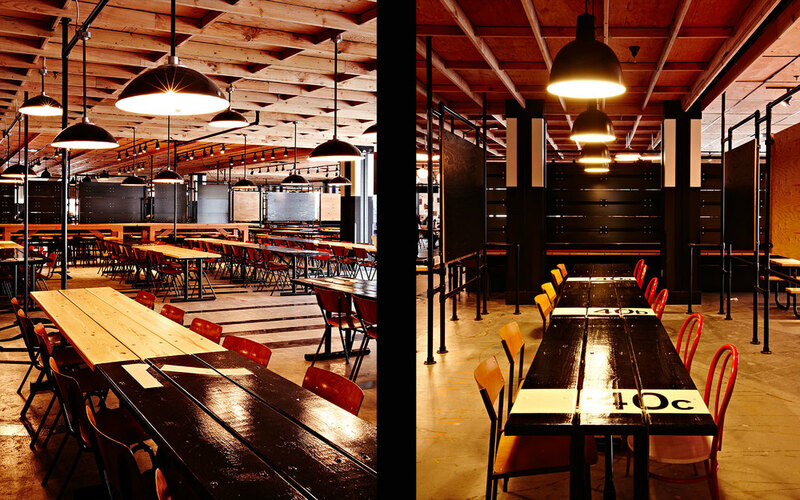 The firm’s goal with the mess hall was to undermine the formality of the typical corporate cafeteria. They deconstructed the ceiling and exposed the framing to create a camp-like vibe, or a work in progress. Slick black tables and the bar level booths fill the space, along with print art, exposed light bulbs, and exposed rivets galore.